In a small bowl, add the garlic and onion powders and the spices: cinnamon, cayenne pepper and paprika. Leave the mixture aside. Generously coat the pork chops with salt and pepper from both sides. Evenly sprinkle each side with ¼ of the spice mixture. 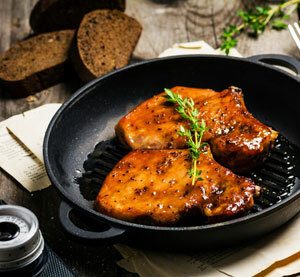 Drizzle the pork chops lightly with olive oil on both sides and leave them aside. As soon as the grill pan has heated well, add the pork chops. Cook each side for 7-8 minutes, depending on how thick the chops are. Using a basting brush, coat each steak on both sides with the honey mustard. Remove the pork chops from the grill pan and serve warm.